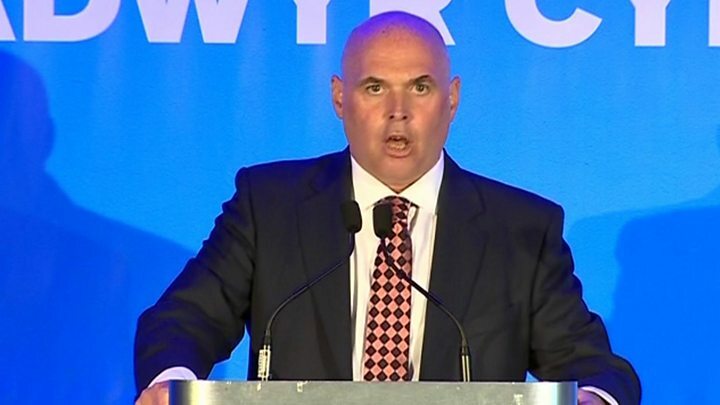 Paul Davies has won the battle to lead the Conservative opposition in the Welsh Assembly. He beat Suzy Davies by a two-to-one margin in the contest to take over from Andrew RT Davies, who stepped down in June after seven years in charge. The Preseli Pembrokeshire AM had been interim leader of the 12-strong Senedd group, the second largest after Labour. He said the party had a duty to offer a "progressive, innovative and radical alternative" to Labour. Celebrating his victory, Mr Davies said: "To the members from right across Wales who put their trust in me - thank you - I will not let you down." He described leading Conservative assembly members as an "absolute privilege" and said it was "now time for us to raise our game". Welsh Conservative chairman Byron Davies told activists at Ffos Las racecourse, Carmarthenshire, on Thursday that Mr Davies won a postal ballot of party members by 68.1% of the votes to 31.9% on a turnout of 52%. Mr Davies warned it "cannot be healthy for our democracy" for Labour to win the next assembly election in 2021. "If they win a sixth consecutive term at the next election, they'll be close to 30 uninterrupted years of power," he said. "We have a duty at the next assembly elections to offer the people of Wales a progressive, innovative and, yes, radical alternative to more of the same." But the new leader admitted the Welsh Conservatives had "gone backwards" at both the 2017 general election and the 2016 assembly poll. The party needed to be "ready for the political fight of our lives", he said, adding: "Before we can transform our country we must first transform our party." Mr Davies acknowledged a lack of diversity amongst Welsh Conservative politicians, saying: "Our elected ranks are not sufficiently representative of the whole of Wales." He pledged a "genuinely diverse slate" of candidates at the 2021 assembly elections, admitting it was "still extremely worrying that the Conservative Party, which introduced many of the great reform acts has never had a female MP in Wales". During the leadership campaign, Mr Davies said he would be open to the idea of a coalition with other parties to wrest power from Labour. Speaking to BBC Wales following his victory, he said: "My door is always open." But he added: "I've also made it clear that if there is a coalition deal on the table, then our members will have the final say on that." Prime Minister Theresa May offered her congratulations, saying she looked forward to working with the new leader and his team "as they hold Labour's failing Welsh Government to account". "There has never been a more vital time to do this, and I know that Paul will do a fantastic job speaking up for the Welsh people," she added. Conservative Welsh Secretary Alun Cairns praised what he called the "enthusiasm, ideas and close collaboration" he would bring to the role. Paul Davies succeeds Andrew RT Davies, who quit the leadership of the group in June saying he felt he had lost the support of his colleagues. Leadership election campaigns have been sparked in all four main Welsh Assembly parties this year. In August, UKIP named Gareth Bennett as the winner of a grassroots ballot for Senedd group leader over his predecessors Neil Hamilton and Caroline Jones. Plaid Cymru's Leanne Wood faces a three-way battle with Adam Price and Rhun ap Iorwerth for her leadership of the party this month, while later this year Welsh Labour will elect a successor to Carwyn Jones, who is stepping down as leader and first minister in December. Can Paul Davies help the Welsh Conservatives break their duck? They've never held Welsh Government office and they're desperate to make some headway. With a Plaid Cymru leadership contest underway there might be a chance of a post-2021 election deal, depending on who ends up leading Plaid. But Mr Davies faces big challenges within his own party, particularly around finding a way to cut through to a wider base of support amongst voters. He's also trying to persuade the party in London to give the Welsh Conservatives greater autonomy. The statement of congratulations sent by Theresa May emphasising his status as the leader of the party's AMs in the assembly rather than Welsh party leader suggests he'll struggle. All change for Welsh Assembly party leaders?